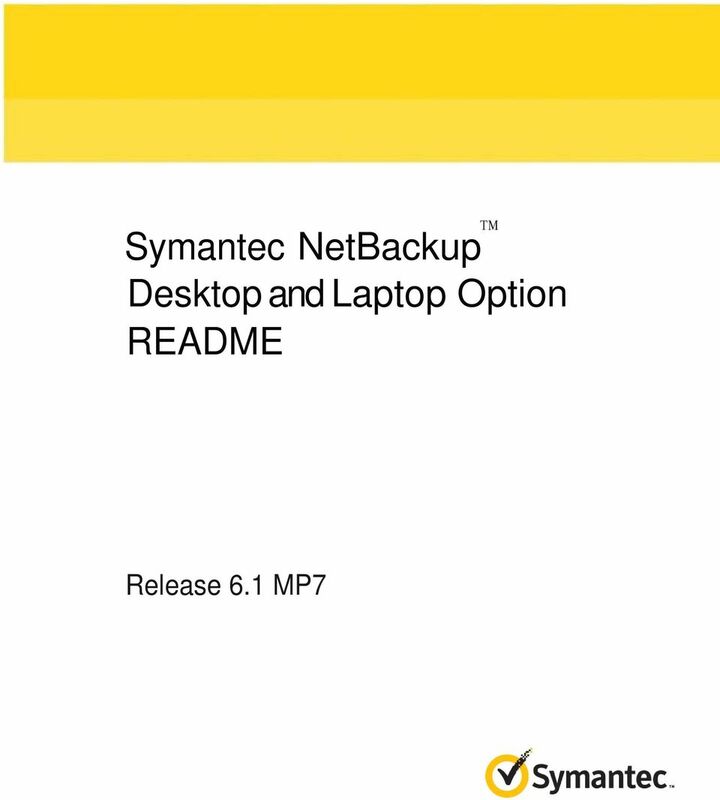 Download "Symantec NetBackup Desktop and Laptop Option README. Release 6.1 MP7"
5 5 Additional Enterprise Services Symantec offers a comprehensive set of services that allow you to maximize your investment in Symantec products and to develop your knowledge, expertise, and global insight, which enable you to manage your business risks proactively. 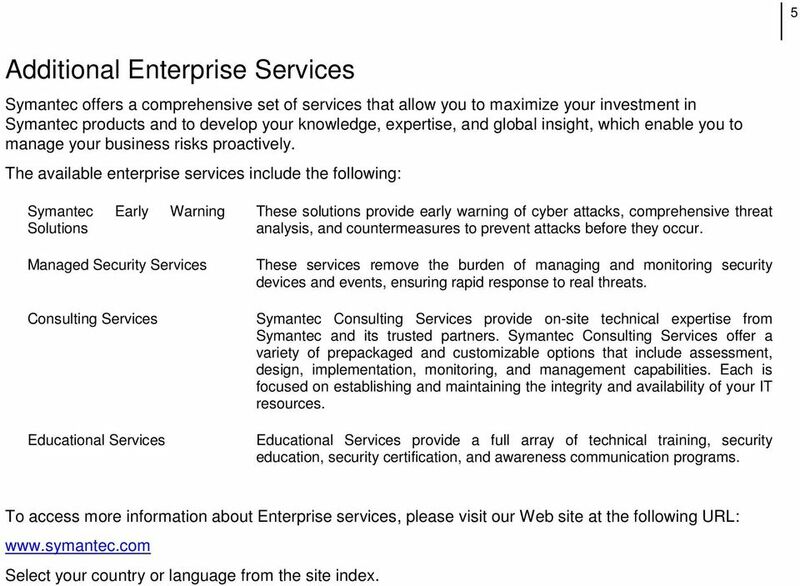 The available enterprise services include the following: Symantec Early Warning Solutions Managed Security Services Consulting Services Educational Services These solutions provide early warning of cyber attacks, comprehensive threat analysis, and countermeasures to prevent attacks before they occur. These services remove the burden of managing and monitoring security devices and events, ensuring rapid response to real threats. Symantec Consulting Services provide on-site technical expertise from Symantec and its trusted partners. Symantec Consulting Services offer a variety of prepackaged and customizable options that include assessment, design, implementation, monitoring, and management capabilities. Each is focused on establishing and maintaining the integrity and availability of your IT resources. Educational Services provide a full array of technical training, security education, security certification, and awareness communication programs. To access more information about Enterprise services, please visit our Web site at the following URL: Select your country or language from the site index. 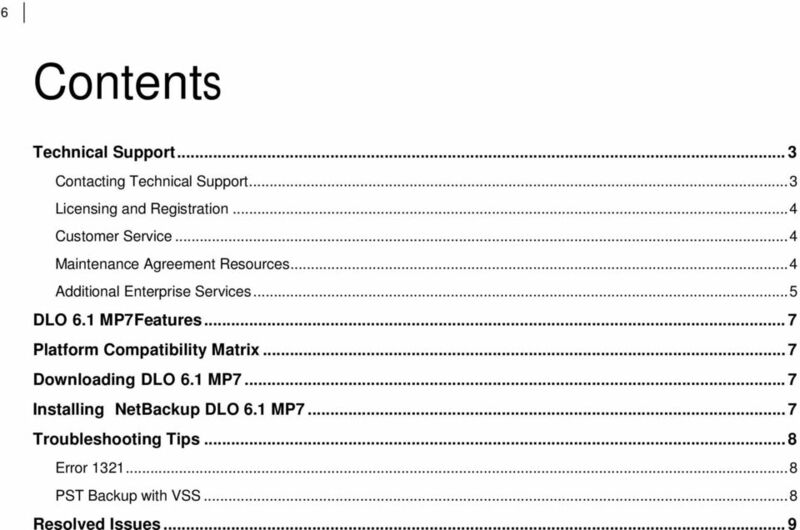 7 7 DLO 6.1 MP7 Features The following are the features in DLO 6.1 MP7: Enhanced Include/Exclude Declarations: File types can be included for a parent directory but can be excluded for a child directory inside it. Low Disk Space Error Messages on LUDF and NUDF can now be turned off: 0% threshold value is allowed now to stop getting low disk error messages on machines with huge storage. NOTE: Localization is not provided in DLO 6.1 MP7, and DLO 6.1 MP7 supports only the English version. Do not apply this version if localization is a requirement in 6.1 MP7. Platform Compatibility Matrix For information about the Compatibility Matrix of supported Server operating systems, Agent operating systems, Office Suites, and SQL Servers, refer to the NetBackup Desktop and Laptop Option Compatibility Matrix document. Downloading DLO 6.1 MP7 To download DLO 6.1 MP7, perform the following: 1. Download the appropriate files into a temporary directory: NBU_DLO_61_7_M_x64.zip NBU_DLO_61_7_M_x86.zip NBU_DLO_6.1MP5_ET _2.zip (required only for the existing DLO 6.1 MP5 customers but not for DLO 6.1 MP5A customers) 2. To extract the files, double-click on the.zip file. This helps to create a number of files that include x64.readme, x86.readme and setup.exe. 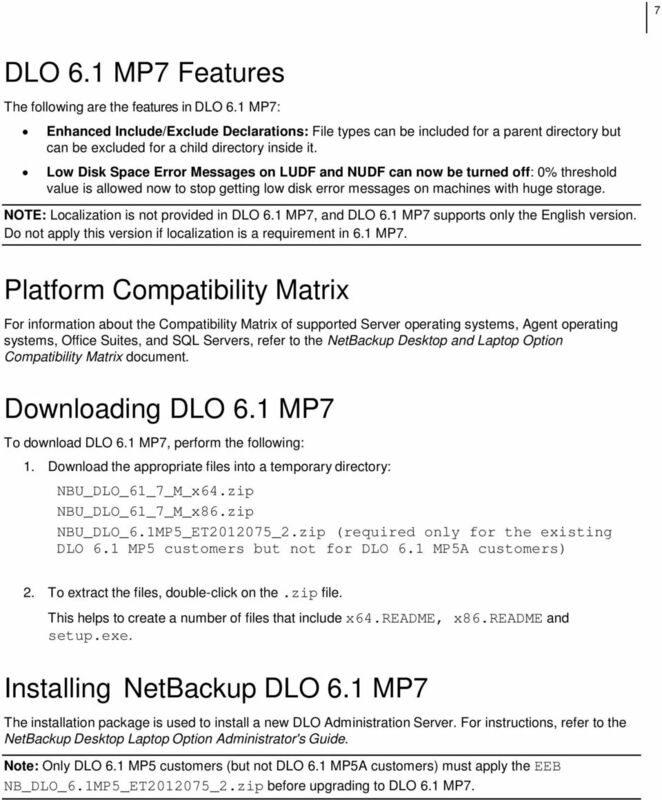 Installing NetBackup DLO 6.1 MP7 The installation package is used to install a new DLO Administration Server. For instructions, refer to the NetBackup Desktop Laptop Option Administrator's Guide. Note: Only DLO 6.1 MP5 customers (but not DLO 6.1 MP5A customers) must apply the EEB NB_DLO_6.1MP5_ET _2.zip before upgrading to DLO 6.1 MP7. 8 8 Troubleshooting Tips The following section describes some issues that you may experience while using the application. A clarification or a tip is provided to resolve the issue. Error 1321 DLO installer displays the following error message: "Error The installer has insufficient privileges to modify the file C:\ProgramFiles\Symantec\NetBackupDLO\Data\DLO.mdf." Description This error occurs when you uninstall the DLO server and attempt to re-install it in the same location using a SQL Server 2005 database. When you uninstall the DLO server, the database files (DLO.mdf and DLO_log.LDF) are not deleted. When you try to re-install the DLO server, the DLO installer uses the old database files instead of installing the new versions. To use these files, you must have full rights. Generally, the administrator has full rights to use these files. However, the error may still occur. Resolution Make the following changes in each file: 1. Right-click on the file and select Properties. 2. On the Security tab, grant full rights to the Administrators group. 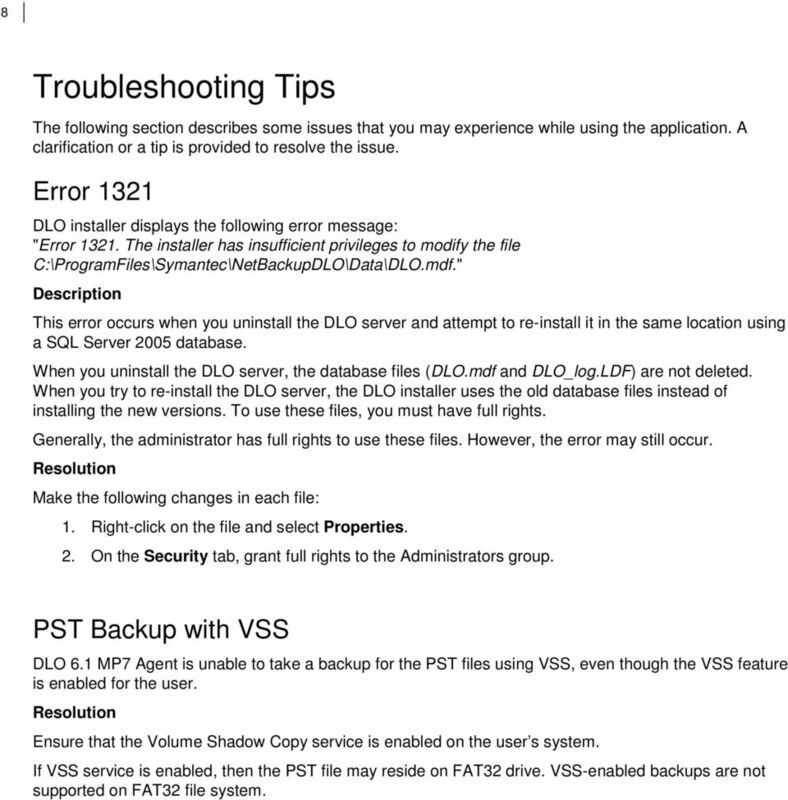 PST Backup with VSS DLO 6.1 MP7 Agent is unable to take a backup for the PST files using VSS, even though the VSS feature is enabled for the user. Resolution Ensure that the Volume Shadow Copy service is enabled on the user s system. If VSS service is enabled, then the PST file may reside on FAT32 drive. VSS-enabled backups are not supported on FAT32 file system. 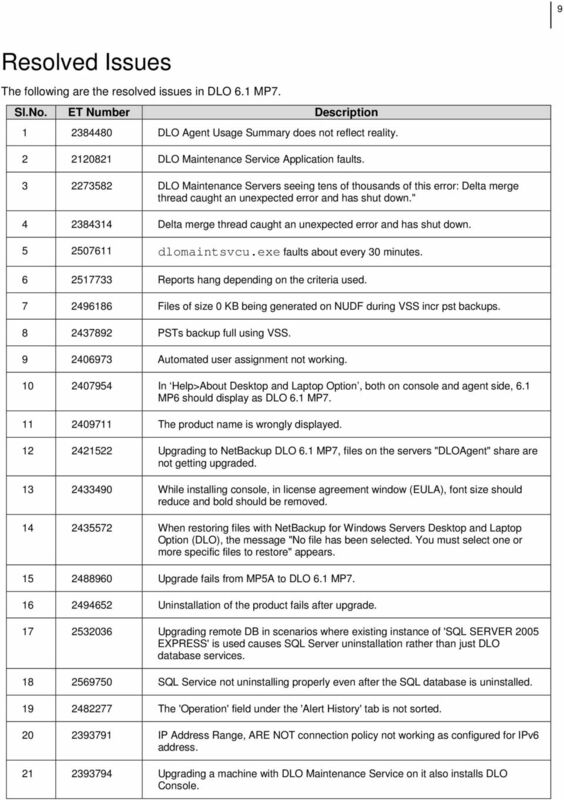 9 9 Resolved Issues The following are the resolved issues in DLO 6.1 MP7. Sl.No. ET Number Description DLO Agent Usage Summary does not reflect reality DLO Maintenance Service Application faults DLO Maintenance Servers seeing tens of thousands of this error: Delta merge thread caught an unexpected error and has shut down." Delta merge thread caught an unexpected error and has shut down dlomaintsvcu.exe faults about every 30 minutes Reports hang depending on the criteria used Files of size 0 KB being generated on NUDF during VSS incr pst backups PSTs backup full using VSS Automated user assignment not working In Help>About Desktop and Laptop Option, both on console and agent side, 6.1 MP6 should display as DLO 6.1 MP The product name is wrongly displayed Upgrading to NetBackup DLO 6.1 MP7, files on the servers "DLOAgent" share are not getting upgraded While installing console, in license agreement window (EULA), font size should reduce and bold should be removed When restoring files with NetBackup for Windows Servers Desktop and Laptop Option (DLO), the message "No file has been selected. You must select one or more specific files to restore" appears Upgrade fails from MP5A to DLO 6.1 MP Uninstallation of the product fails after upgrade Upgrading remote DB in scenarios where existing instance of 'SQL SERVER 2005 EXPRESS' is used causes SQL Server uninstallation rather than just DLO database services SQL Service not uninstalling properly even after the SQL database is uninstalled The 'Operation' field under the 'Alert History' tab is not sorted IP Address Range, ARE NOT connection policy not working as configured for IPv6 address Upgrading a machine with DLO Maintenance Service on it also installs DLO Console. 10 10 Sl.No. 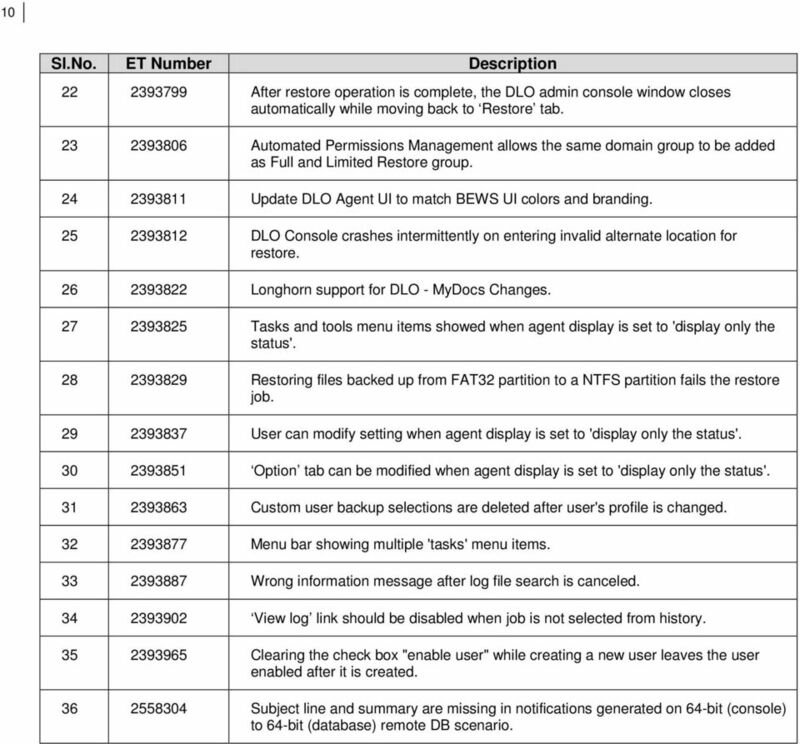 ET Number Description After restore operation is complete, the DLO admin console window closes automatically while moving back to Restore tab Automated Permissions Management allows the same domain group to be added as Full and Limited Restore group Update DLO Agent UI to match BEWS UI colors and branding DLO Console crashes intermittently on entering invalid alternate location for restore Longhorn support for DLO - MyDocs Changes Tasks and tools menu items showed when agent display is set to 'display only the status' Restoring files backed up from FAT32 partition to a NTFS partition fails the restore job User can modify setting when agent display is set to 'display only the status' Option tab can be modified when agent display is set to 'display only the status' Custom user backup selections are deleted after user's profile is changed Menu bar showing multiple 'tasks' menu items Wrong information message after log file search is canceled View log link should be disabled when job is not selected from history Clearing the check box "enable user" while creating a new user leaves the user enabled after it is created Subject line and summary are missing in notifications generated on 64-bit (console) to 64-bit (database) remote DB scenario. Recovering Encrypted Disks Using Windows Preinstallation Environment Technical Note Preface Documentation version Documentation version: 11.0, Release Date: Legal Notice Copyright Symantec Corporation. Symantec Response Assessment module Installation Guide Version 9.0 The software described in this book is furnished under a license agreement and may be used only in accordance with the terms of the agreement. PGP CAPS Activation Package Administrator's Guide 9.12/10.0 The software described in this book is furnished under a license agreement and may be used only in accordance with the terms of the agreement. 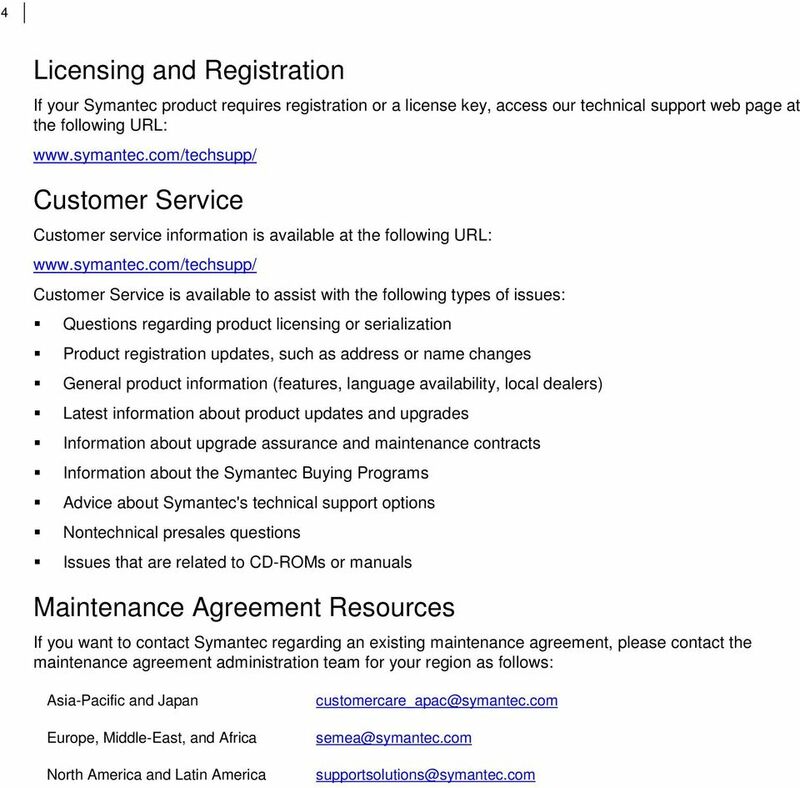 Symantec Endpoint Protection Integration Component 7.5 Release Notes Symantec Endpoint Protection Integration Component 7.5 Release Notes Legal Notice Copyright 2013 Symantec Corporation. All rights reserved. 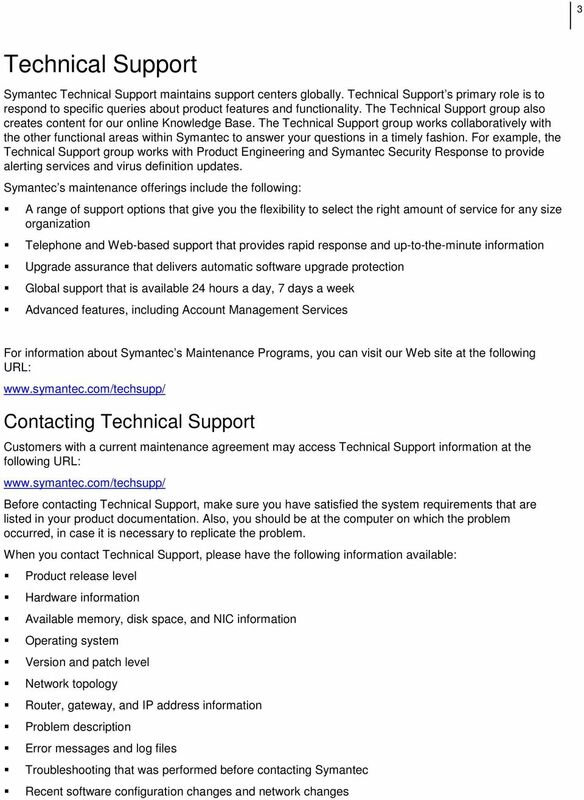 Note: To view the most recent version of this document, go to the Products section on the Symantec Corporation Web site.